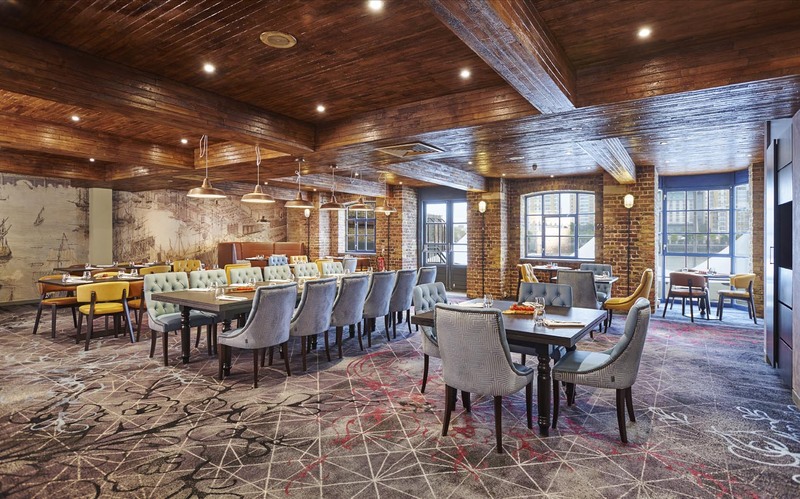 We visited Columbia Terrace, the restaurant located inside the recently refurbished Doubletree Hilton Docklands. Columbia Terrace is located right on the Thames so as you can see from the photos above we had amazing views of the Thames and Canary Wharf as we wined and dined. 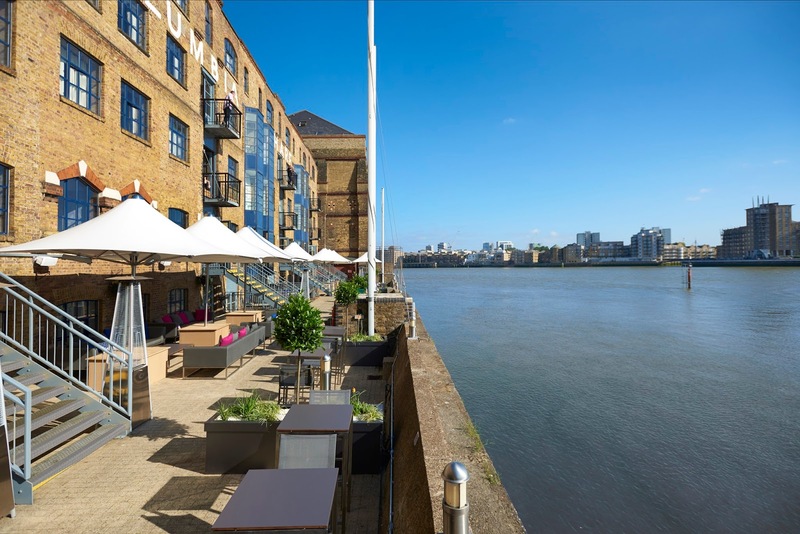 You can reach Columbia by river cruise from Canary Wharf where it drops you off right outside the restaurant, bar and BBQ terrace. Perfect if you want to avoid the London traffic. Sadly we did have time to make the most of the terrace. I would love to return to sit outside and admire the stunning views, even in the winter as the terrace is heated and there are blankets so it can be enjoyed whatever the weather. There’s even a separate, dedicated cigar deck which offers table seating. To start our indulgent evening, we shared Devonshire crab on sourdough (£8.50) and Wild mushroom on toast (£7). Both were absolutely delicious, we were wary how the crab would taste but we were pleasantly surprised. It went down so well and the taste wasn’t overpowering like we had feared. We both agreed that the starters were the highlight of the evening for us. I could have eaten a few more portions of each but we had to save ourselves for our main course and dessert (of course). As the restaurant is nautical themed there is plenty of fish on the menu. For main I went for Spiced cod loin on mildly curried risotto (£16). I’d been craving risotto for the past week so this dish was perfect. The risotto was unlike any I had eaten before, the curried flavour was as described and perfect for a palette which isn’t a fan of anything too heavily spiced. It’s a dish that could be enjoyed by even the fussiest of eaters. My guest went for Meantime beer battered cod (£14). The portion was huge (like the spiced cod loin) make sure you visit hungry! For the location and being a London restaurant the prices are very affordable seeing as the portions are so big! Hotel restaurants often get the wrong impression of being expensive with small portions but this wasn’t the case. Also the restaurant felt distant from the hotel and we felt totally welcome as non residents. My cod and risotto portion was very generous, it had me fearing that I wouldn’t have space for dessert. But as I’d been craving chocolate all day I had to order Chocolate pot with salted caramel and hazelnut praline brittle (£6.50). The brittle was incredible and definitely the highlight of the dish. Natalie went for the Apple and blueberry crumble (£6.50). You can view the full a la carte menu here. The wonderful views as you dine are a major selling point for me, I couldn’t stop turning around just to admire it. Thank you Columbia Terrace for having us and for finding my train pass (oops!) The service was friendly and completely faultless. If you fancy visiting Columbia Restaurant yourself, they are currently offering 25% off the a la carte menu and bottomless prosecco or bloody Marys for an additional £20pp every Sunday between 12-9pm.